Let me explain. I get asked this quite a lot; not so much online but out in the physical world. Though I try not to show it, it’s a question which makes me want to head for the nearest door. Don’t get me wrong, it’s always nice when people ask you about your writing but with this particular inquiry, I can’t shake the suspicion that the face in front of me is only smiling so amicably in anticipation of my saying how much I like kids. How much I identify with them. Or perhaps even how, given that I don’t have any children of my own, writing children’s fiction fills the void. Me as a child growing up in Aberaeron, Wales. The problem is that none of this is true. I do like children, very much, but I never think about them when I write. I think about them afterwards, once the work is done. Like many writers, it is only when the thing is finished that my mind turns anxiously to the audience, which in my case means hoping any child who comes across what I’ve written will feel the world is a little more magical than they thought. Or something to that effect. Oh yes, when a story is complete, the reader is everything. But that doesn’t change the fact that during the writing process, the only person I seek to please is myself. Indeed, there are times when I believe that writing fiction is the most selfish activity one can pursue. In writing for children, what I am most concerned with is the kind of stories I enjoyed when I was little. I have little regard for anyone else. I am writing to entertain the eight-year-old me. (Eight is when I remember receiving my first proper letter from Father Christmas, courtesy of my magical mother.) 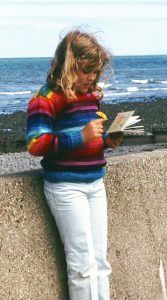 So if you want my advice, which of course you’re free not to take, I would suggest that writing children’s fiction is only for you if it’s wrapped up in your own childhood and relished by the part of you which has never grown up. On the other hand, if you can do it differently, good for you. One of the great things about writing is that the outcome is all that matters. As long as what you end up with works, who cares how you got there?